Thin Brick Party Wall Leaks Noise - How to Remedy and keep Slimness? We've got a 1938 row house in Washington, DC, and when the inspector came he said the party wall is a "brick-block-brick" configuration. The wall has a coating of plaster applied directly to the brick. He said because of that configuration noise shouldn't be an issue. Boy, was he wrong on all accounts! Televisions, music, phone calls... everything comes through. My guess is we have a single layer of brick for the party wall, or at most two poorly constructed layers. Our row house is very narrow, so we are very concerned about making it even more narrow. 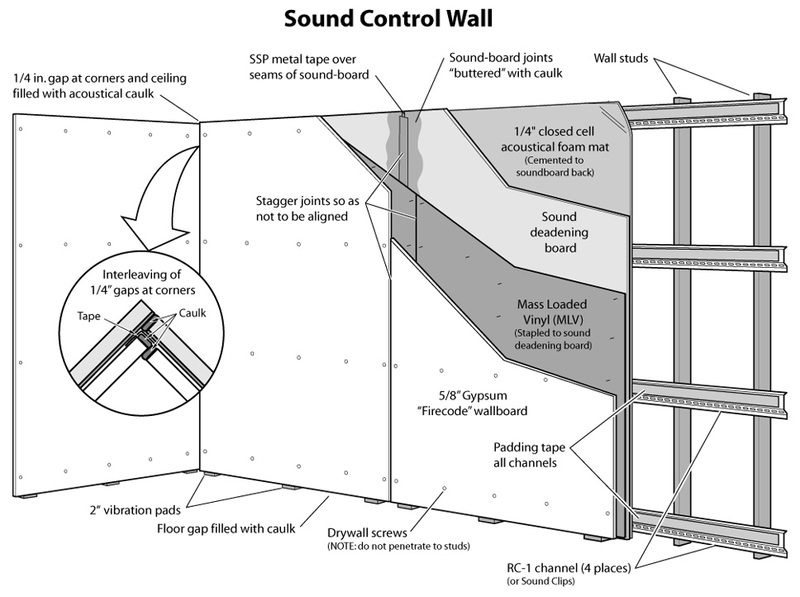 We have to figure out how to sound proof the wall to the highest STC rating we can without adding much in the way of depth. I know that the first thing I need to do is remove all of the plaster on the walls themselves, and a little bit on the adjacent walls to provide space. I'm even thinking of taking down a small part of the adjacent wall the separates two rooms so I can do the whole wall as one rather than two smaller walls. As well, I'll need to pull up some of the floor boards for the same amount of space. Here is where I'm not sure how best to proceed. Because I am concerned with depth, there will not be enough space for insulation. I'm okay with that with regard to temperature control because it's an internal wall and there's no insulation now. My main concern: Will furring strips attached to the brick support all of the above materials? My next main concern: Are either of the above options going to solve the problem, or should I be thinking of another remedy? I greatly appreciate any and all help, thoughts, and advice! Re: Thin Brick Party Wall Leaks Noise - How to Remedy and keep Slimness? Ok in order to save some space and get you a quality reduction here is what I recommend. Place these vibration pads every 2' on the floor prior to drywall installation. Now for the final layers, you have a couple options. 1/4" foam mat with PSA on the back of the first layer of sheet rock before attaching to hat channel. attach first layer of sheet rock with foam mat backing to the channel then use green glue and the second layer of sheet rock. making sure you leave the 1/4" around the perimeter and fill with acoustical caulk for each layer of sheet rock. Same as above except omit the 1/4" foam mat and use Mass loaded vinyl in between the 2 layers of sheet rock with green glue on the last layer of sheet rock. sheet rock/ MLV / Green Glue / sheet rock. test the brick before you go buying a bunch of material to check the structural integrity of the old brick. shoot a couple tapcon or equal anchors in to see if the brick holds it...remember with this system the weight of the sheet rock will be on the vibration pads on the floor so we are not concerned about the weight load, just the integrity of the brick. Randy, thanks for the response! Much appreciated! 1) Do you think your suggestion is thinner than option B I put in my original post, or is this going to provide better sound proofing? 2) When you say R-8, I'm assuming you do not mean rigid foam insulation. It appears that the cotton insulation comes in R-8, but I don't see it for sale on your site. Do you sell it? Also, won't this setup put pressure on the insulation? I always thought you wanted insulation to stay as "fluffy" as possible. 3) Are you suggesting I set up the SSP Clips and Hat Channels to run vertical, just like a stud? 5) If I went with your option B and used MLV instead of the 1/4" foam mat, could I use 1/8" MLV? Sorry I have so many questions. I'm just trying to get the best bang for the buck, and the best sound reduction for the thickness! 1)Yes it is slightly thinner 2 5/8" vs. 2 3/4" and provide a better reduction. 2) yes, I do not mean rigid board...2" cotton fiber or mineral wool.. we do sell it, it is not on our shopping cart but you can phone in your order. Depending on where you are located would dictate cost vs. effectiveness. R-8 is supposed to be 2" thick but usually comes in at 1 1/2" so it will be fine. 3)No the clip and channel or resilient channel always run horizontally. clips will be spread every 48" apart and channel to be spread no more than 24" between channel. 4) 1/2" is fine but I want as much weight as I can get so for the pennies difference I would go with 5/8" 2.3 lbs per sqft. 5) my option B is to use MLV and omit the 1/4" foam. If you want to get into the details and principles just give me a call direct and I will be more than happy to assist you. Thanks for the help. I'm definitely going to give you a call, especially to figure out what I'll be able to order from you, but I wanted to show you this first. I put a hole in the wall, and there's one inch of covering over cinder block. At least it looks like it's cinder block (potentially grey brick). From what I've been told the covering is two types of plaster. The first is a course covering, whereas the second is a white finish coat. Again, this is all original to 1938. Do you have any thoughts on the sound absorption of this material? Is removing this covering and installing what we've already talked about going to do the trick? Or, by removing the plaster am I significantly decreasing the sound absorption and therefor need to "redesign" the option we've already talked about? Whoops - here are the pictures! ok this is a problem, I dont think your going to be able to secure the clips to this layer. your most likely are going to have to get to the cinder block for secure connection. Most important is the what ever mass you take off is going to have to be put back in one form or another.